Blood sugar control is a continuous challenge for diabetics, regardless of whether you are type 1 or type 2. Luckily there is one easy way to get closer to your target levels. Just make it a habit to walk for 30 minutes a day, 7 days a week. Exercise helps muscles absorb blood sugar, preventing it from building up in the blood stream. This effect can last for hours or even days, but it is not permanent. 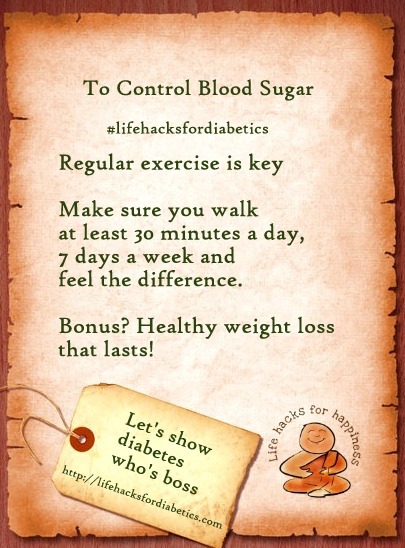 That is why you must walk regularly for continued blood sugar control. Bonus? You’ll also lose weight and keep it off. Can’t say no to that eh?